My wife said there was some interest in scuba diving here in Korea. As some people know I founded the 38th Parallel Divers to assist Expats in diving here in Korea. One more step to that goal was getting my Instructor, Specialty Instructor and Master Scuba Diver Trainer Rating from PADI. July 2014 saw the beginning of the journey to becoming an Instructor. So what is the course like? Stressful but extremely educational. Check out the daily breakdown as I complete the IDC. We are a growing group of divers that dives or who has dived at the 38th Parallel. We are mainly an English-speaking group however some of our divers (and non-diver friends) speak Korean, Russian, Spanish and more. Our members range in experience from Shore Support (non-divers) to Master Instructors. We are very fortunate to have several instructors in our group and a great relationship with Aquatic Frontier. Aquatic Frontier has certified many of our divers and we are just continuing our passion for diving. We are not bound to diving the East Coast of Korea; there have been trips to the Philippines and throughout the South of Korea and several islands like Jeju-do. If you don’t have your own equipment and want to dive no problem, our friends at Aquatic Frontier can set you up with everything you need. What to further your diving knowledge and expertise? Aquatic Frontier offers everything from Basic Open Water to Master Diver for non-professionals and Divemaster for those who are looking to go even further. Almost all PADI specialties are offered as well. If you are new to Korea or just want to get back in the water, please come dive with us. Everyone is welcome, non-diving spouses too! If you dive with us at the 38th Parallel we will give you a certificate of recognition showing the day and your personal dive number when you completed the dive. This is a great memento that FEW divers can say they have. 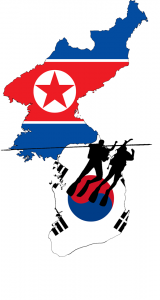 “Like” us to see when we are diving the 38th Parallel next, or check us out on the web here. I just had a bee flying around in my room and thought about your blog. when is this scuba stuff coming? That is too funny! Well… my husband branched off on his own feel free to check it out: http://38thparalleldivers.com . Enjoy!